I’d like you to try something out with me this morning, a guided visualization. If you will, close your eyes and clear your head. Imagine only darkness, inky blackness to every margin of your mind. As you usher any remaining thoughts from your consciousness, pay attention to the sound of your breathing. Don’t try and change it, just notice it. Now, as you take your next breath, imagine the air filling every corner of your body, slipping behind your ribs and under your belly and enlarging even your fingers and toes. Take another deep breath, and as you release it, imagine that the wind rushing from your body is shaping the darkness in your mind’s eye. That the black ink has begun to ripple, like waves pushed toward the shore on a windy day. 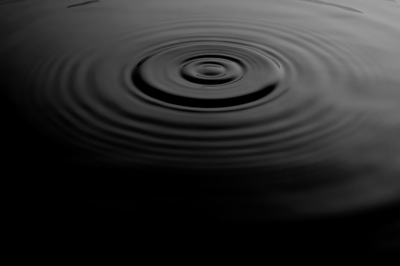 Play with that for a moment, your breath moving over the darkness in your mind, and the ripples it’s making. How deep is the pool of darkness? Is it a puddle? Is it a lake, or an ocean? Is it a galaxy? How choppy are the waves? Do the deeps of your interior resist the disruption of your breath, or are the black waters inside you choppy like a storm at sea? Keep breathing. Keep your eyes closed, but now I want you to notice that somewhere, maybe high above your waters, maybe far out on the horizon, or perhaps illuminated from below, there is light. Slowly, open your eyes, but hold on to that image of the vast waters within you. As you take in the familiar sights of the sanctuary, don’t lose track of the memory of the ocean inside. You know, don’t you, that you are made up mostly of water. I’ve heard that, as infants, we’re made up of 75 – 80% water, and that the percentage decreases as we age. Parts of our body are waterier than other. Our brains are 85% water. Our bones are more like 10 – 15% water. As a college student I worked in a series of group homes, some for kids in state custody, other for adults with persistent mental illness. Despite their differences, one thing they held in common was a superstition that on nights when the moon was full, the residents would be just a little bit wilder. I remember a co-worker trying to convince me this was because, just like the moon’s gravitational force pulls waves from the ocean, it also exerted some tidal force over the waters in our body, making us a little crazy. The moon has been waxing gibbous for days now, on its way to a full moon tomorrow night. How are your waters this morning? Have they been roiling about inside you? Are they crashing against your heart? The scriptures this morning are overflowing with water. The waters of creation from Genesis. The voice of God thundering over the waters in the psalm. The baptisms of the Ephesians by water into the name of Jesus. Then, Jesus himself entering into the waters of the Jordan followed by the epiphany that this one is the Beloved of God. Truth is, we hear these scriptures fairly frequently in worship. It was just weeks ago that we read the story of John the Baptist crying out in the wilderness as we waited for the coming of God in Christ during the season of Advent. Here we are again, back in that story, but this time on the other side of Christmas, the festival of the incarnation. How does this story change, when read on the other side of Christmas? One thing that happens for me after Christmas is that the balance of my attention begins to shift away from hopeful expectation to present incarnation. I find myself waiting less and seeking more. Seeking signs that God has become fully immersed in my experience, in the experience of the world. The world’s waters are certainly stormy these days, as they always are somewhere. There is the almost literal example this past week of the high seas adventure in the Gulf of Oman wherein a boat load of Iranian hostages who’d been taken hostage by Somali pirates were rescued by American Navy sailors. Then in metaphoric waters not too far away, there is a new storm brewing in the Persian Gulf, as the United States attempts to broker a peaceful resolution to tensions between Israel and Iran over Iran’s nuclear weapons program. Even as we finally pull out of Afghanistan, and the president has voiced support for a greatly reduced military program, the threat of a new war in the Middle East looms. Those far away waters seem so much larger than the bodies of water within us, but our personal storms are no less devastating. We have endured the loss of loved ones. We fear the loss of loved ones. We are looking for work. We are fighting for our marriages. We are afraid for our children. We are praying that the new life surrounded by the waters in our wombs will be borne safely into this world. Every conceivable body of water you can imagine is stirred up right now, and it is on these stormy shores that Jesus arrives this morning to be baptized. As we stand back along the banks with the others who left the safety of the city behind to come hear what John the Baptist was preaching, the epiphany is that the waters into which Jesus is baptized are our own! Imagine that. Really, go on. If it will help, close your eyes again and find the pool that fills your heart, the one that threatens to break the levees of your life. Now listen, now see – the God that was present at creation, whose breath moved over the waters, has come down to your shore. That God, the one wrapped up in the flesh of Jesus is immersed today in you. God, whose voice thunders over the waters; Jesus, whose voice stilled the seas; the Holy Spirit, whose breath brought order out of chaos – the entirety of God is being baptized in you. You are the river into which God desires to dive. Once Jesus came up for air, a voice from heaven spoke, saying “you are my Son, the Beloved; with you I am well pleased.” But, consider this, that one – God’s pleasure, God’s beloved – that one was sent to you. How deeply God must love you. Like waters overflowing the banks of a river, God’s love has arrived, washing over you.